Hi! Welcome to Simply Courageous, my little slice of the big ol', crowded Internet. I'm Dani, the girl behind the blog, and I just wanted to introduce myself! NI & working full time on a hotel reception. people, so expect to see some Jesus chat here. I became a Christian when I was 18 years old, in my last year of school! Also, expect to see alot of David. We've been together 4.5 years now, & I couldn't imagine my life without him! I'm quiet, but I'm not shy. I love animals, and will quite happily have a house full of them some day. in bed with a book and giant mug of tea. and it was the best decision I've ever made (#noregrets!). I'd do it all over again in a heartbeat! I started this blog almost 2 years ago now (in November!) 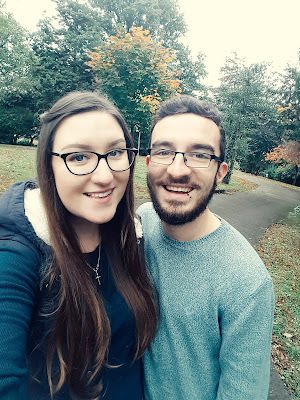 as a way of getting some creativity back into my life, giving me a space to share my life and my thoughts and mainly as a place to write whatever I fancy! I love writing, almost as much as I love reading, and I nearly always have a handful of notebooks and journals on the go at once. This blog sits nicely alongside them as a place to share my thoughts with whoever will listen! my faith is a huge part of my life and who I am, so I hope that will come across in my blog, in a natural, simple way. I'm just sharing my life and my experiences as they happen, and I hope I can share this with you too! to a roadtrip to a city break to a full blown holiday! I hope to include everything I do here, as a way of sharing these experiences with you and also as a way of looking back in a few years to be reminded of everything I've seen and done! I also love, love, love to read, so you'll see a great deal about books here too!! Mainly recommendations and what I've read recently, I haven't quite worked up to reviews yet. My most read genres are Sci-fi/Fantasy, YA and Dystopian. As you can probably tell, I love being able to be completely immersed in a brand new world. Aside from these things, you'll find ramblings on life in general from a 26 year olds eyes, other random chit chat and things I love!